Before I start with this post, I would like to thank all those who have shared their valuable inputs on my last post, "Should I Quit?" Your comments and words of encouragement are very well appreciated. Knowing and learning from other people's experiences is truly a big help in coming up with a very important decision especially if that decision may affect your family and your life in general. Now, speaking about life affecting decisions, I guess securing our family's future has always been the goal of everyone. First and foremost, we have to know where we are financially. To do this, we have to make a list of our assets and liabilities. 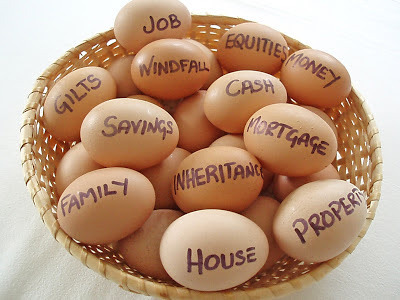 We have to identify what we currently have like savings, receivables, jewelries, bonds and properties. Next, we have to make a list of what we owe like credit card balances and loans. Do your math. Subtract what you owe from what you own and from there we could identify our net worth. Determine the financial phase we are currently in. It is very important to identify whether we are just starting, building up, growing or have reached a total financial freedom. Starting up stage are for those who had just graduated from college and just started with their jobs. Building up stage is for those who are having a stable source of income and are able to make some investments out of their income. Growing up stage is for those who have substantial investments and are working on growing their investments, and the final stage is the total financial freedom where we are already enjoying the fruits of our labor where we do not need to work but just enjoying the income generated by our investments. Make a plan. After we have identified which phase we are in, it's time to set our goals. We have to make a budget and learn to have a clearer view of our income versus our expenses. We must be able to figure out if our monthly earnings is enough to cover for our monthly expenses. If not, or if it's just balance, then we have to start working out for new ways to augment our income. Make a budget. If our earnings is more than our expenses, then we can very well progress with the build up stage by saving enough to work on future investments. Stick with the budget. Allocate a certain percentage of our earnings to savings and just try to live with what was left. Evaluate your expenses and examine your purchases. Try spending on things that will put more money in your pocket. Invest on health insurance plan or make sure we are contributing to something like Phil Health to protect ourselves and our family in times of unforeseen events. Better yet, allocate some funds for health purposes. Take appropriate vitamins, go for regular medical check ups and focus on health and wellness. Health is wealth. Get out of debts. This is a must in order for us to have a stress free life. Avoid getting into unnecessary debts where possible. If we have to, make sure it's being paid on time to avoid paying big interests. Share our blessings and be a blessings to others by showing good examples and taking part in community and church projects. This can create a positive energy that may attract more blessings because the more we feel blessed, the more we tend to get additional blessings. Like what I usually comment whenever I see posts about getting financially freed, the most hardest part with this is the first step. And the most questions are "how are we going to start when financially we are broke deep down?" Those are sound advice. Since kids started school last year, I haven't been able to save as much as I used to do. Didn't realize just the baon and transpo would eat a huge chunk of the budget. We're hoping to get back on track this year. Thankfully, we're far from being in the red. It is great that you added 8. It is what gives meaning to life. Making a budget is the hardest coz the expenses every month varies especially when someone celebrates his/her birthday, lol! First step is always the hardest part, If only I'm making enough extra money to set my goal for the year. I would take baby step at a time about my financial side of my life. great post! Good advice there. There are many factors to be considered as financially secured but there are also many ways to achieve it. All the best to working towards your goal. Great tips. Another great tips sis. We always prioritized the basic needs then save. I will try to make your tip #1 first so I should know where to start. Thank you for sharing. I always find financial advice so inspiring, but somehow, I can never take the 1st step. Commodities are rocket-high nowadays. Thanks for the advice. I love to plan, but I usually can't stick to the budget. :( I'm still on the learning process. These are really great tips. All I need now is the will to follow through. Sometimes, with meager income, people would ask "What budget?" Because usually, as soon as you get your paycheck, it slips out of your hands with all the payables hehehe. It's been like that for me for some time, so part of my plan is reduce expenses...that way I have something to budget and hopefully save some money. Great post, Krizza! I am a CPA, but I didn't even care about looking at my financial position and condition. I am on my way, thankfully, although the road to financial freedom has been bumpy (esp since I am a recovering shopaholic). What I had a hard time re-learning is how I treat my assets. Robert Kiyosaki in Rich Dad, Poor Dad literally turned around my accounting knowledge when he said that your asset is not an asset if it is not generating income for you. I'm having a tough fight about No. 7..getting out of debt. I'm not earning much so I really have to give my best...I hope I can do this. With 5 children and still a long way to go in getting them through college, it's still a tough fight and far from total financial freedom. But God is good. He provides everything we need. Great post, Krizza. I love this post, Krizza. I especially like the last tip. Most people are concerned with building their finances but don't know that in order to be wealthy, you need to give back. Personally, I aim to "give back" to God and community before I do anything else. Great tips, Krizza! How do we know that we have achieved financial freedom? I don't like debts and we always pay our credit card in full. Great advice. I'm debt free that's the only thing I'm happy about. I'm broke but debt free. Totally dependent on my husband. Hayz. I do agree with Farida! I broke my budget last March to give my son a decent birthday. Hehehe..Thanks for the advice! i am working on reducing debts.I really want to have more cashflow and have more savings too.This a great list of tips! I always want to live below our means but every month there are unexpected expenses popping out. (#7) I'm proud to say I don't have debts on my credit cards hehehe I usually avoid using them. But we have a bank loan for the two lots in an decent subdivision that we'll be paying for nine years more, that is why whenever we receive our bonuses deretso na agad sa banko para hindi na magastos sa iba.